New York Film Academy Los Angeles was thrilled to host a conversation between veteran actors Billy Dee Williams and Academy-Award winner Louis Gossett Jr. on May 18, 2011. 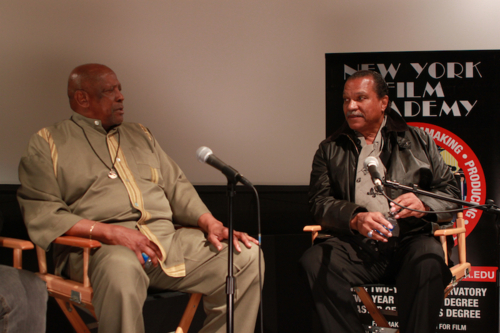 Academy-Award Winner Louis Gossett Jr. (Left) Interviews Star Billy Dee Williams (Right) at NYFA. New York Film Academy students and alumni packed the house for a screening of The Empire Strikes Back followed by a Q&A with Billy Dee Williams. The event was moderated by legendary actor Louis Gossett Jr. Though Louis Gossett Jr. and Billy Dee Williams have known each other professionally for 40 years, it was the first time the stars have appeared on stage together. Billy (Right) appears as Lando Calrissian in Star Wars. Billy has been in over 40 films and 70 television shows throughout his career. He is well known for starring as Lando Calrissian in the epic Star Wars: The Empire Strikes Back and Star Wars: The Return of the Jedi. He has also co-starred twice with Diana Ross, first as Louis McKay in Lady Sings the Blues and later as Brian in the critically acclaimed film Mahogany. Louis Gossett Jr. received a 1983 Oscar for An Officer and A Gentleman. 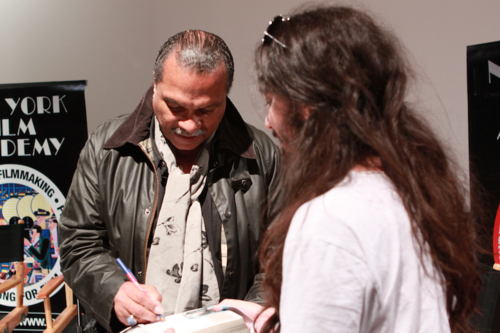 Billy Dee Williams signs autographs for NYFA students and alumni. 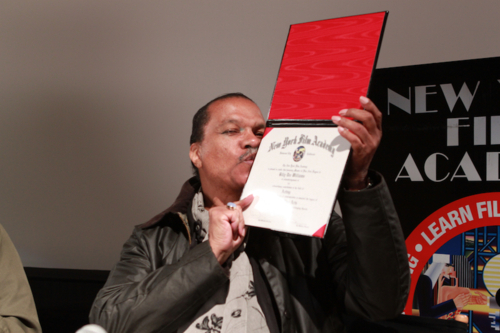 Star Wars Actor Billy Dee Williams Receives Honorary MFA Degree from New York Film Academy. Students rose to their feet for a standing ovation for Billy Dee Williams, who received an honorary MFA degree from the New York Film Academy. The two stars later posed for pictures with students and signed autographs. Black Entertainment Television (BET) will be doing a follow up piece on the event. In addition, New York Film Academy will be posting video clips of the interview in the coming weeks. New York Film Academy extends a huge thank you to Billy and Louis for a memorable evening.